As dietitians, during our patient appointments, you can assume we will ask about the foods your child eats, foods they dislike, stooling patterns, and medications/supplements (amongst many other things!). 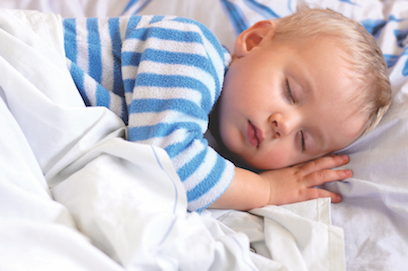 One question that might catch you off guard is “How is your child sleeping?” After all, what does sleep have to do with nutrition? Sleep habits have been shown to impact obesity among adolescents (and adults!). Specifically, inadequate sleep has been shown to correlate with high BMI, high body fat percentages and increased waist and hip circumferences. In the HELENA study, inadequate sleep for adolescents was defined as less than eight hours per night (as defined by the National Sleep Foundation). In contrast, adolescents that slept longer were found to have significantly lower BMI’s. So how does sleep exactly impact obesity in adolescents? There are hormonal changes with inadequate sleep habits that have been found in adult studies that likely also apply to adolescents. For example, hunger hormones increase and satiety or “full hormones” drop with inadequate sleep, thus making individuals hungrier without feeling satisfied when they eat. Then there are lifestyle changes that take place with inadequate sleep. For example, more opportunities to eat, increased fatigue, less energy to exercise, and an increase in unhealthy food choices. All of these things combined end up making a vast difference in our daily nutrition–excess calories consumed and less physical activity! Sleep, along with having set times for family meals, snacks, and limited screen time are so important to nutrition. Next time you enforce bedtime, know that you are also doing more than making sure your child isn’t cranky the next day. Garaulet, Marta, et al. “Short sleep duration is associated with increased obesity markers in European adolescents: effect of physical activity and dietary habits. The HELENA study.” International journal of obesity 35.10 (2011): 1308-1317.